As you may be aware, this week is Fashion Revolution Week. That means there are events on all around the world with the common goal of changing the current fashion system for the better – for the garment workers who make our clothes, for the planet that gives us the resources to make what we wear and for us as consumers. It’s a week to think about how we can embrace and enjoy fashion without harming others or our environment, and perhaps even how fashion can do good in the world. My go-to solution for doing good via what I wear is – as regular readers know only too well – to shop at opshops, where I’m donating money to a good cause through my purchase and keeping a secondhand garment out of landfill (opshopping is good for my wallet too!). 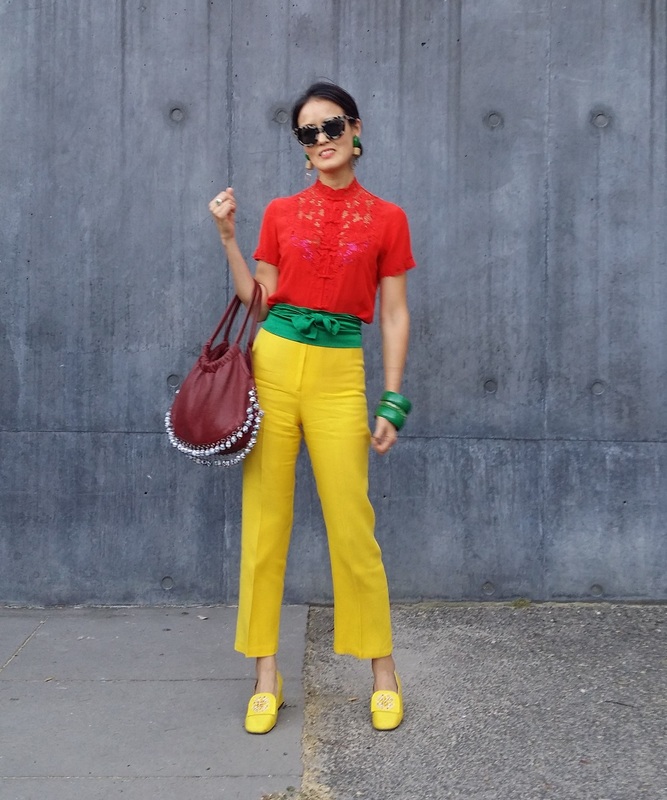 One of my favourite opshop/DIY outfits – I love these yellow pants from Vinnies that just happen to match some yellow silk slippers from the Salvos. The red silk blouse is from a vintage shop and I made the green silk sash and my earrings. I’m also partial to a good clothing swap and like to keep myself informed about ethical, sustainable fashion labels (particularly local Melbourne ones). And now I’ve found out about Tumnus, an online fashion sharing platform which lets you lend out your wardrobe and borrow pieces from other ladies. Given how often I attempt to clean out my wardrobe but just can’t let certain pieces go, despite only wearing them once a year, this sounds like a great idea. Someone else gets to wear them while I’m not, and I get to experiment with other people’s pieces temporarily too. Tumnus is having a pop-up event in Melbourne this weekend, with the launch event this Friday (April 27). I’ll be speaking about opshops and general thriftiness at the launch, so come along, sign up to Tumnus and get sharing! It’s a free event but you’ll need to register – all the info is here. Hope your shopping event was good, what did you end up buying? An excellent grey wool Karen Walker aviator jacket. Put it on and the fit was perfect, then my friend who also works at Red Cross told me it was hers, she donated it – we laughed and my husband suggested I just raid her wardrobe because this is not the first time it’s happened!